Watkins Glen is a place I like to visit during the summer. This is the boat harbor at the Southern end of Seneca Lake. Ithaca is beyond the hills in the background. 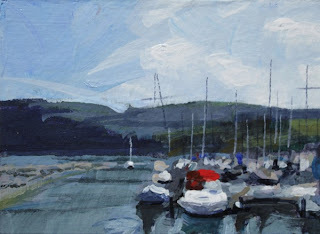 Boats have so much detail that it's impossible to paint it all, and I wouldn't want to include all of it because it would make the painting too "busy." It's good to practice to simplify a scene into it's basic shapes and colors. The bit of red on the boat in the foreground contrasts nicely with the more neutral blues and greens of the rest of the painting.